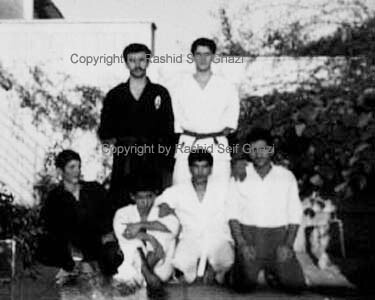 Karate Homepage صفحه اول کاراته Language / Sprache:. The ultimate training program for the whole body. Body Power is a movement combination of elements from Aerobics and martial arts. 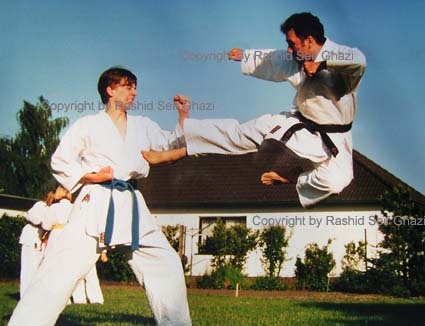 Perseverance training from elements of the martial arts of karate and as well as muscle training and physical awareness are interconnected. This new program was developed and worked on by me. Body Power is a combination of Fitness, movement and fun, whereby one also loses redundant weight gaining strength. With Body Power you develop your own hidden strengths with the old arts of self-defense. All of the muscles are effectively trained. 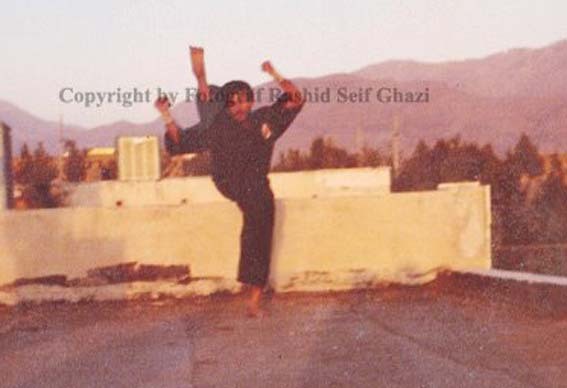 In my opinion it is an optimal sport combination, which combines different elements from a variety of martial arts. Above all, we train perseverance, strength, co-ordination as well as equilibrium. It allows improvement of the physical motor skills. Muscles are strengthened with weights. With musical accompanyment, different exercises are done which are carried out individually in a program (which was first developed by me). 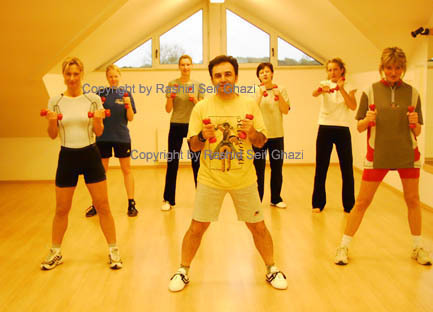 The individual exercises are demonstrated first by me and then done together as a class. The refinements are developed together. It’s great fun! Body Power is also good for dealing with stress and makes the body and soul fit! What is, actually, a sport? Sport tells above all healthy to live. Sport helps you in an especially difficult time to live healthy and to stay healthy. In addition you must eat not only healthy, but move yourselves above all. Sport offers a comprehensive program for the improvement of the quality of life: They find balance, remain younger and have all together more joy in the life.An actual training of the whole musculature delivers a lot of condition to you. In addition, the fitness walking along with it can help to lose überschüssiges weight, to strengthen organism and blood circulation with it also particularly and to stimulate even the sexual activity and to preserve till old age. Be fit nothing has to do to weigh itself constantly. Tells to be fit to feel good, to be in form and to look good for himself. How this goes, Rashid with his experienced fitness program points you! Train with my flash program and you will see what you can reach with it. Come to a superform, feel better you look better! Sport is "in" - you take part! 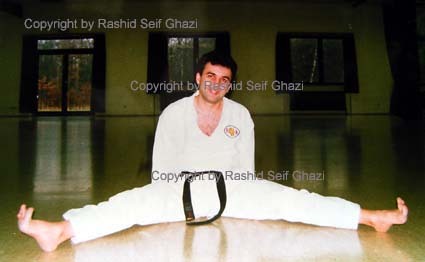 As a result of 30 years karate I have prepared 2 books and 2 CD with photographs with the topics: "Karate - martial art, selfdefense, bodycontrol" and "The ultimate training program for the whole body , Body Power & Nutrition"
My food program. : Feeling comfortable in your own skin doesn’t only require plenty of excercise, but also a balanced diet. Aside from the enjoyment and personal gratification, the significance of nutrition for the individual lies particularly in the effect on the individual’s health. Those who nourish themselves in an unbalanced manner for long periods of time are bound to experience health problems. One is often so stressed by family, work or school, that they " find it difficult " to also “have to” worry about nutrition. There are so many simple alternatives: Fast food and a quick-fix lifestyle is all over the place. Sure, it is always easier to open a can than to steam vegetables. But shouldn’t it be worth it to pay a little more attention to our diet every day...? We fill up our cars with super, don’t we? And shouldn't we, as instructors, at least be able to explain nutritional basics and give our members support when asked questions about nutrition? You can ask me. I’ve written a book concerning healthy nutrition: "Training and Nutrition – The Best Way"
Food and drinking with pleasure and mind. Food and drinking is for us a little bit an everyday. For some rather a must, for others a pleasure in full trains... However, for many food is also connected with bad conscience because one has eaten either too much or sometimes again the wrong. To the fact comes that in the media over and over again new fright announcements unnerve the consumers. Water an especially important, food ". The body exists to about 60 percent of water, this is therefore a main part which fulfils vital tasks. One can get by longer time without food, however, only few days survive without drinking something. Water helps the body to retire, e.g., poison materials (about the kidney) helps water to maintain the body temperature what is vital, above all, in summer. Just if one eats less than normally, into the bargain sport floats, one must pay attention to a sufficient liquid supply! The minimum should lie between litres 1/2 and two. During hot summer days, with the sport, in the sauna, illnesses one can rise to four litres. Whether one drinks enough, one is able to do well in the "removal amount" he approx. 1.5 litres had to do your body daily grazes leave a little on the toilet have to go is no special achievement, but simply the result one. Vitamins are able to beside the support of the power production and the cell construction still even more. Investigations have shown that itself, above all, the vitamins A, C and E well work as, radical catcher ". 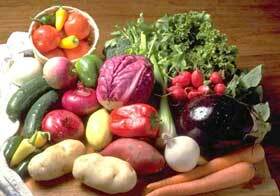 They can be taken up with the help of fresh fruit and vegetables or as tablets. Consciously and healthy live and also easily decrease? 1. A lot of movement. 2 Healthy food and a lot of drinking. 3 a training for the whole body, because one thereby loses superfluous weight. Nevertheless, two hours before the sport should be neither drunk, nor be taken up a larger amount in food. This would load the organism during the training Too very much. Please, after the training Healthy food and a lot of drinking. Please, no pills, form diets or other "Schlankmachen" " food you only so much, as you really need, rather a little less. Eat, above all, wholemeal bread, wholemeal pasta and many spices. Spices make food tastier. A lot of fat it is not same fat - choose dear olive oil and sea fish delivers beside valuable egg white also vitamin E. Separate egg white from coal hydrates .Essen you a little bit weiniger, however, 5 times per day. And sweets, chocolate, chips, ketchup, mayonnaise, chips, cream and, sauce are forbade!!! To the support with the decreasing it is favorable, e.g., 1 tablespoon to mix apple vinegar in 1 litre of water every morning drink a glass or after food Kaffe and espresso or (unsweetened ones!) drink grapefruit juice: The request materials and tannic acids reduce the fat resorption of the preceding meal. It can go, besides, draw lots for mineral substances like calcium / magnesium, nevertheless, also, equalise i.e., perhaps, with mineral tablets.
" Training and food - your best way "